Integral Mixing | Quantum Technologies - Quantum Technologies Inc. Paint Dispersion, Iron Oxide Dispersion, Precipitated Calcium Carbonate, Mixing using Catalyst, Saturation Mixing, Production of Hypochlorous Acid among others. The High Temperature, High Pressure (HTP) Bowl will allow you to safely and conveniently conduct high temperature, high pressure experiments accurately and consistently without adversely effecting the physical characteristics of the pulp. Incorporate several features to allow high temperature, high pressure experiments to be conducted in a safe environment. Pressure transducer accurately measures pressure in bowl. lts flush mount design eliminates any possibilities of pulp plugging. Quickly and easily relieves pressure in the bowl without the worry of steam build-up. This is done through the special evacuation system. Be able to inject up to 100 mL of chemicals into the bowl without leaving any residual chemicals in the piping. This can be done with our new pressurized 100 mL injector. Fit any Quantum Mark Platform. Be available in a 2-L or 4-L size bowl. Be Stainless Steel with a Teflon Coating. temperature and pressure due to reaction with metallurgy. Equipped with a pressurized injectionsystem. 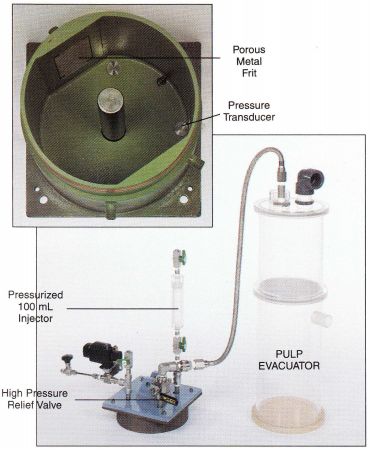 Able to relieve pressure quickly with the help of pulp evacuator. Equipped with pressure transducer that is flush mount with the bottom of the bowl. This transducer works 0-200 psig, -40'C-149'C. Contact us today for step-by-step procedures on the above processes.